Methane-burning generators at a landfill. On the Methane, Anaerobic Digesters and Biogas page I told how when I was a kid a friend and I collected “swamp gas” by poking the marshy bottom of a local wetlands with a broom stick. That wasn't too much different than the idea behind capturing methane from landfills. The swamp gas was methane, which is a natural result of decomposition. Methane is also a major greenhouse gas. I have to admit I’m not a huge fan of landfills and I wish we were doing a lot more to reduce the waste stream than we are, but at least landfills are being a lot better managed than they once were. And they have the advantage of concentrating our junk in one area. If someone ever wants to dig up plastic in 100 years, they’ll know where to look for it. Landfills also concentrate decomposing material in one area. As it decomposes, the buried material releases methane. Landfills are responsible for about 20% of methane produced in the United States. In the past, the gas simply escaped into to the air, adding to the greenhouse effect problem. Fortunately, that’s changing. It‘s possible to collect the methane and use it as fuel in much the same way methane from biodigesters provide fuel. Conceptually the system is straightforward. Engineers sink a series of perforated pipes into the landfill and connect them to a series of collecting pipes. The methane rises through the perforated pipes and the collecting pipes deliver it to a processing plant. 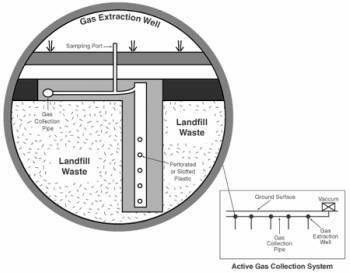 Once collected, there are several ways to use the methane. One is to use it directly to produce heat for projects like heating a boiler, warming greenhouses, kiln-drying wood or even firing pottery. Another approach uses the methane to power generators or turbines to produce electricity. Cogeneration plants are particularly good at this since the methane is first used to make steam to drive a turbine to produce electricity. After the steam drives the turbine it condenses again into hot water. That residual heat is also captured and put to use. Cogeneration plants make the overall efficiency of the project very high. In addition to these methods, land fill methane can also be added to the natural gas grid. All in all the increasing harvesting of methane from landfills is a good thing. While there is still some carbon dioxide emitted when the methane is burned, the resulting CO2 causes much less greenhouse effect than the methane would have. Also, any energy produced reduces the need to use other, possibly “dirtier” sources. As I’ve said many times on this site, I think our successful alternative energy plan will turn out to be a result of many ideas rather than a few big ones.